I go to a dance class once a week and it is super fun with many energetic super fit women. They are patient and kind as I am just a beginning learning the steps. After class, we end up snacking on home made sweets and today was no exception because we always find a reason to celebrate. I ended up taking a bunch of goodies home from my group of generous friends. 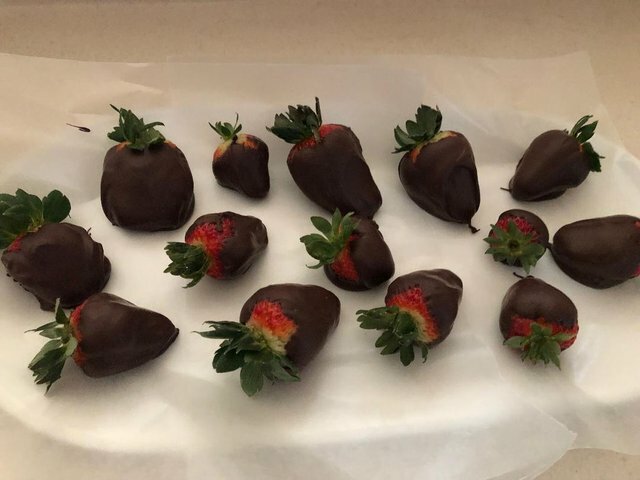 I just finished making these chocolate covered strawberries as a pre-Valentine's day treat for my son's teammates tonight. The recipe is simple. I purchase the fresh large strawberries and wash and dry them. I microwave a bag of semi sweet chocolate chips with 1 Tbsp. of extra virgin olive oil for about two minutes. After coating each berry, I place them on waxed paper and put the entire batch in the refrigerator. hey, you got discord or telegram? You published more than 1800 posts. Your next target is to reach 1900 posts.